Wilfried Zaha inspired Crystal Palace to a crucial win over Brighton that moves Roy Hodgson’s side six points clear of the relegation zone. Zaha scored the first of five goals in a thrilling first half by tapping in on the goal line in the fifth minute after Mat Ryan had saved Luka Milivojevic’s shot. 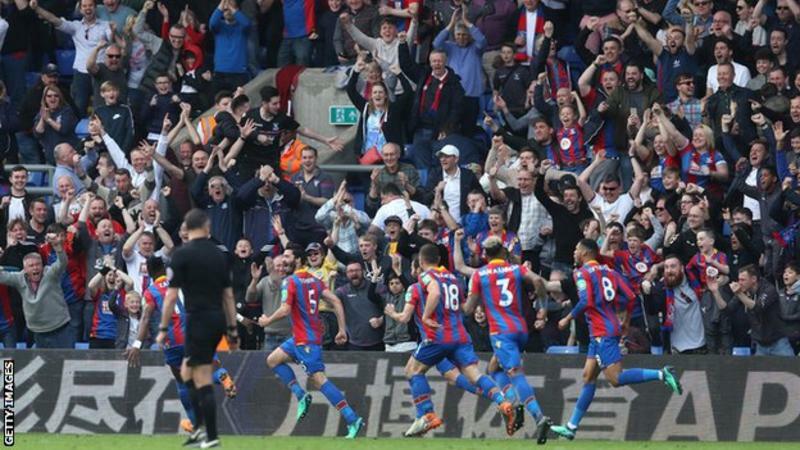 A rampant Palace scored a second nine minutes later when James Tomkins scrambled the ball home at a corner. But Glenn Murray halved Brighton’s deficit, hooking the ball in via the crossbar after Lewis Dunk had headed towards goal at another corner. The impressive Zaha capitalised on more poor Brighton defending to head in his second from Milivojevic’s lofted cross in the 24th minute, only for the visitors to again pull a goal back 10 minutes later when Jose Izquierdo calmly finished across Wayne Hennessey. Palace tired in the second half and rode there luck when Glenn Murray missed a straightforward chance in stoppage time by failing to volley in Solly March’s cross from three yards. However they held on for the win which moves them up to 16th in the table while Brighton are 13th with one point more than Palace and, with a difficult run-in to come, are still at risk of relegation. Palace started the game in ferocious fashion, not looking like a team who had won only one of their previous seven home matches. They surged forward with pace through Zaha and Andros Townsend and Milivojevic sprayed passes in midfield and won the ball back powerfully. Hodgson’s side capitalised on poor defending for all three goals but each was reward for the intent they showed in the opening half. The Eagles suffered as a result of that blistering start in the late stages but they held out thanks to the commanding Hennessey in goal, an excellent block from Mamadou Sakho to deny Glenn Murray and the striker’s late miss. Palace dropped into the bottom three briefly during Saturday when Southampton led Chelsea 2-0 at St Mary’s but the Blues’ late-comeback and their own win means the gap to the 18th-placed Saints is six points. That cushion is even more remarkable given the fact the south London club had no points and had not scored a goal after seven games of the season. They now have a gap between themselves and the relegation zone and one thing many of their rivals do not, a serious attacking threat. If Palace’s start was the perfect one in a game between two rivals, Brighton’s was the opposite. After 14 minutes they were behind to two set-piece goals. First, they did not track Milivojevic and allowed him to carry the ball into the area after a short corner and then they failed to clear another corner before Tomkins scrambled the ball home. Murray pulled Brighton back into the game with his smart finish but defending again cost the visitors when Ezequiel Schelotto let Zaha to head in unchallenged at the back post to restore Palace’s lead. Brighton moved into 10th place when they beat Arsenal on 4 March but have since only collected one point from four games. They have a game in hand over their relegation rivals and a seven-point gap but their remaining five games are all against teams in the top seven. The Seagulls have home games against Spurs and Manchester United to come and also have to travel to Burnley, Manchester City and Liverpool. Crystal Palace manager Roy Hodgson: “The first half performance was very commanding so it was disappointing to concede those two goals. They put pressure on us, got it in the box, got men forward. Luckily for us Wayne Hennessey had an outstanding game so when crosses eluded our defenders he was there. “We clung on for a very important victory. The players’ game management was better, we had a nervous moment on the bench in the last minute, I was desperate for them to keep it in the corner because you never know with footballers.